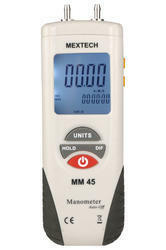 Mextech Manometer measures gauge/differential pressure, it features many selectable units of measurement: InH2O, PSI, Bar, mbar, kPa, inHg, mmHg, ozin, ftH2O, cmH2O, kgcm. We are offered an excellent quality of Digital Manometer.It is an instrument that uses a column of liquid to measure pressure, although the term is currently often used to mean any pressure measuring instrument. Everyday pressure measurements, such as for tire pressure, are usually made relative to ambient air pressure. In other cases measurements are made relative to a vacuum or to some other specific reference.